Coral bleaching at the Great Barrier Reef may be considerably worse than believed, say scientists from the Great Barrier Reef Marine Park Authority, after carrying out an extensive study. In a press release issued earlier this week, the Great Barrier Reef Marine Park Authority informed that over the past two years, global coral bleaching has led to widespread habitat loss and coral decline on the Great Barrier Reef. These conditions led to mass coral bleaching at the end of the summer of 2016 – approximately 29% of the shallow-water coral of the Great Barrier Reef was lost, scientists informed. During the winter of 2016, sea surface temperatures were still above average, and by the beginning of the following summer, the accumulated heat stress on the Great Barrier Reef resulted in a second devastating wave of mass coral bleaching. Marine Park Authority staff participated in aerial surveys conducted by the ARC Centre of Excellence for Coral Reef Studies. Their findings confirmed the extent of the 2017 bleaching event’s severity. As seen in 2016, coral bleaching and mortality vary considerably across the 344,400 square kilometer Marine Park – which covers an area larger than Italy. On 28th March, 2017, tropical cyclone Debbie crossed the coast at Arlie Beach. Experts estimate that about 28% of the total reef area in the Marine Park was located within the path of the cyclone. Surveys carried out by the Queensland Parks and Wildlife Service and the Great Barrier Reef Marine Park discovered that some sites have suffered up to 97% coral loss. Studies carried out after extreme weather events revealed that within very damaged reefs, there were many areas that were relatively unharmed. These undamaged areas are critical for providing the next generation of corals, helping the recovery of the reef. 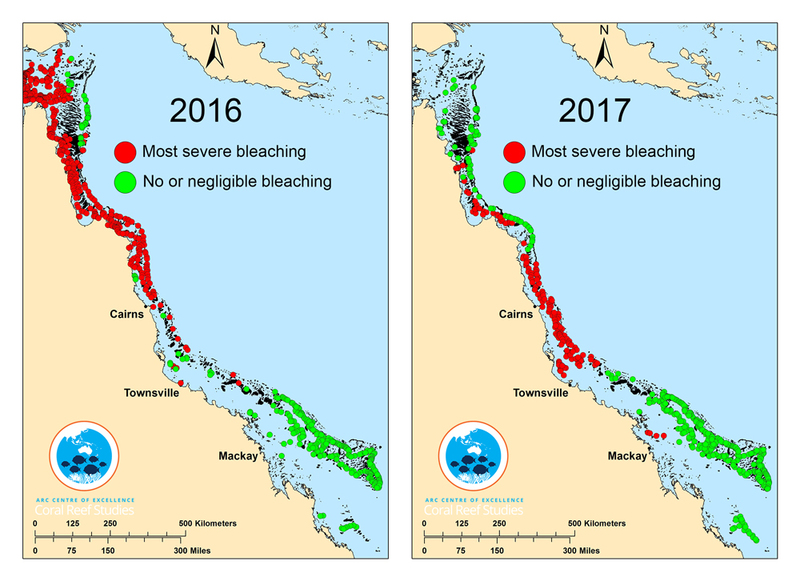 The cumulative effect of the extreme weather events have severely diminished the resilience of most of the reefs north of Mackay, the scientists said. Video – What is coral bleaching? As this Time video explains, global warming, overfishing and pollution are just some of the many toxic things that have caused coral bleaching.